Welcome to Elizabeth Warren Wiki, the most comprehensive source of information and documentation with regard to Elizabeth A. Warren, United States Senator from the Commonwealth of Massachusetts, and former Harvard Law School Professor. 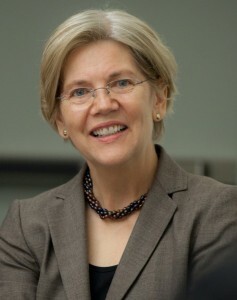 Senator Warren was discussed as a possible Democratic Party presidential candidate in 2016 and again in 2020; she is the leading progressive politician in the country. Senator Warren’s writings and speeches have made national news in themselves. This Wiki covers the highlights of Senator Warren’s background and career, her politics, and various controversies. Additional information will be added on an ongoing basis, including future sections providing greater details and documentation as to Senator Warren’s campaign for Senate, campaign and Senate staff members, professional background, and government service. 9.4 Listed As "Woman of Color In Legal Academia"
9.7 "Unaccountable - Elizabeth Warren and the Cherokee"